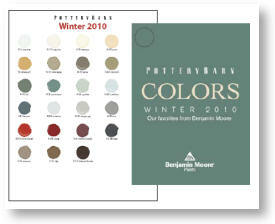 You’d like a Pottery Barn-approved Benjamin Moore color from the Pottery Barn fandeck to update your color scheme. So you pick a nice rich color like Bittersweet Chocolate 2114-10 for the entry hall — with a name like that it’s got to be a rich chocolate brown, right? Well not so fast. After painting a couple of coats on the wall, you notice that it looks like a dark eggplant purple when the sun shines on it. Hmmm… what is going on here? So you head back to Ben Moore to take a look at their fandeck that has ALL the paint colors and their related shades and tones. And voila! The lighter tones of Bittersweet Chocolate are decidedly purple with names like Hint of Violet 2114-60 and Victorian Mauve 2114-50. And that explains why the color Bittersweet Chocolate is not what we might think of as dark chocolate brown. 1) Find the color on the big fandeck and check up and down the strip of shades and tones. You’ll see what that underlying hue is. 2) Also check the color next to a bright white piece of paper. The true hue should pop out even better. Colors also change with the light. So there’s nothing quite like painting a sample board and sticking it to the wall in the area you want to paint. Check the color at night as well as on a cloudy day. Once you’re satisfied that you like the color all the time, then go ahead and paint away! What color is the mauve in the picture with the blue shutters and green door? I’m not sure which picture you’re referring to, Shawna. What post is it under?? You are currently reading What Color Is It? Really… at Your Home & Color Coach.